The engine is ‘Prince of Wales’ 25620 John Ruskin. According to Baxter, it was renumbered 25620 in 1935 and withdrawn in March 1936. At first glance, the photo is very similar to lots of others taken in platform 3 at Stafford, the train facing north and about to leave on a local to Shrewsbury or Crewe. 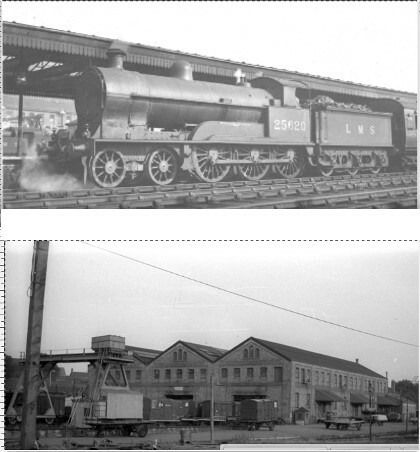 But a close look at the left-hand side of the photo seems to show sheerlegs, as if in a shed yard somewhere, and a building that is certainly not Stafford. Lower photo is Northampton goods supplied by Godfrey Stuart. This is Northampton Castle station. The background building is the goods shed and the equipment in front is the goods yard travelling crane rather than a sheerlegs or engine hoist. It a seems a good fit with the Ordnance Survey. The ‘sheer legs’, I think, are in fact one end of a travelling crane — notice the horizontal beam at the top on which the crane itself would travel, and the building beyond is clearly a goods shed. But I don’t know where.